When you need molecular models that are large, but not too large, we have a range of models to suit both your needs and your budget. For the highest quality molecular models with a fine finish, we use phenolic balls, similar to those used for billiards, with options for ball diameters between 18mm and 50mm, held together with polished solid aluminium rods, Phenolic balls are relatively costly, so if you are able to compromise slightly on the finish to reduce the price, we use painted and lacquered hardwood wooden balls. These have the advantage that the colours can be exactly matched to your requirements. As wood is a natural material with its own intrinsic imperfections, the finish is not as polished and smooth as that of phenolic balls, but this is generally only obvious on close inspection. Like the phenolic molecular models, the wooden balls are held together with polished aluminium rods, which results in beautiful molecular models and crystal structure models that will hold their looks for many years. If these models still aren't large enough for your needs, take a look at our giant molecular models, which use balls up to 150mm (6") in diameter to create huge models. 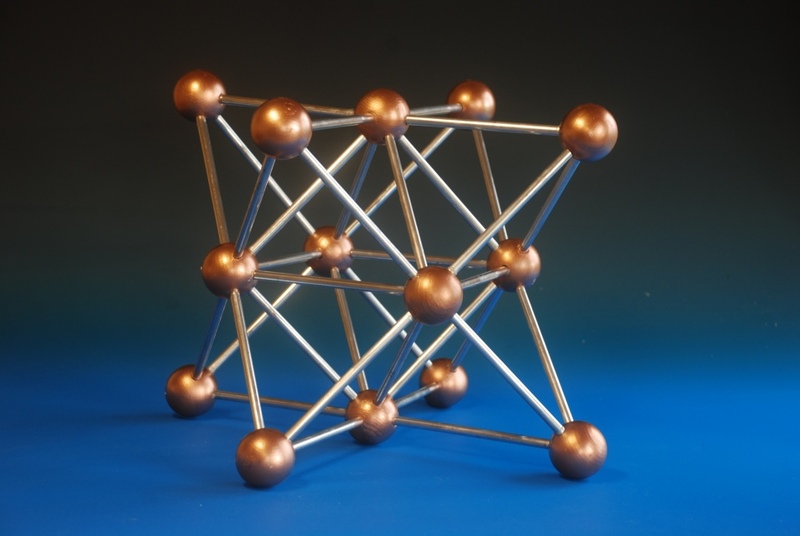 Body centred crystal structure model of Sodium.